Zionism is the Jewish national movement of rebirth and renewal in the land of Israel - the historical birthplace of the Jewish people. The yearning to return to Zion, the biblical term for both the Land of Israel and Jerusalem, has been the cornerstone of Jewish religious life since the Jewish exile from the land two thousand years ago, and is embedded in Jewish prayer, ritual, literature and culture. 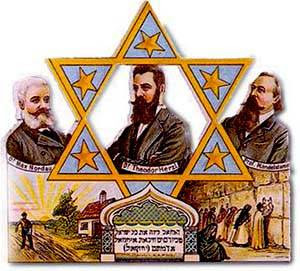 Modern Zionism emerged in the late 19th century in response to the violent persecution of Jews in Eastern Europe, anti-Semitism in Western Europe. Modern Zionism fused the ancient Jewish biblical and historical ties to the ancestral homeland with the modern concept of nationalism into a vision of establishing a modern Jewish state in the land of Israel. The "father" of modern Zionism, Austrian journalist Theodor Herzl, consolidated various strands of Zionist thought into an organized political movement, advocating for international recognition of a "Jewish state" and encouraging Jewish immigration to build the land. Today, decades after the actual founding of a Jewish state, Zionism continues to be the guiding nationalist movement of the majority of Jews around the world who believe in, support and identify with the State of Israel. Zionism, the national aspiration of the Jewish people to a homeland, is to the Jewish people what the liberation movements of Africa and Asia have been to their peoples. History has demonstrated the need to ensure Jewish security through such a homeland. The re-establishment of Jewish independence in Israel, after centuries of struggle to overcome foreign conquest and exile, is a vindication of the fundamental concepts of the equality of nations and of self-determination. To question the Jewish people's right to national existence and freedom is not only to deny to the Jewish people the right accorded to every other people on this globe, but it is also to deny the central precepts of the United Nations.